Sometimes it's just fun to share what we love! We hope you love them, too! The Lee Industries sofa is ideal for cozy, cuddle bugs! This sofa is perfect for lovers of deep seats and super soft cushions! Why MON loves this sofa: If you love to lounge, we always recommend a sofa with a deep seat depth (23" - 27") where we can layer a lot of pillows and blankets on it and feel ultra comfortable! If your space doesn't allow for a very large sofa, then we recommend upgrading your sofa cushions to a cushion with a blend of down feathers so you can still have an ultra comfortable experience. This Lee Industries sofa is a classic three cushion sofa that will never, ever go out of style. The English roll arm is a beloved look that can be paired well with modern accents. Why MON loves this sofa: "When we design a space, we factor in not only the longevity of the quality of the sofa, but also the style of the sofa. 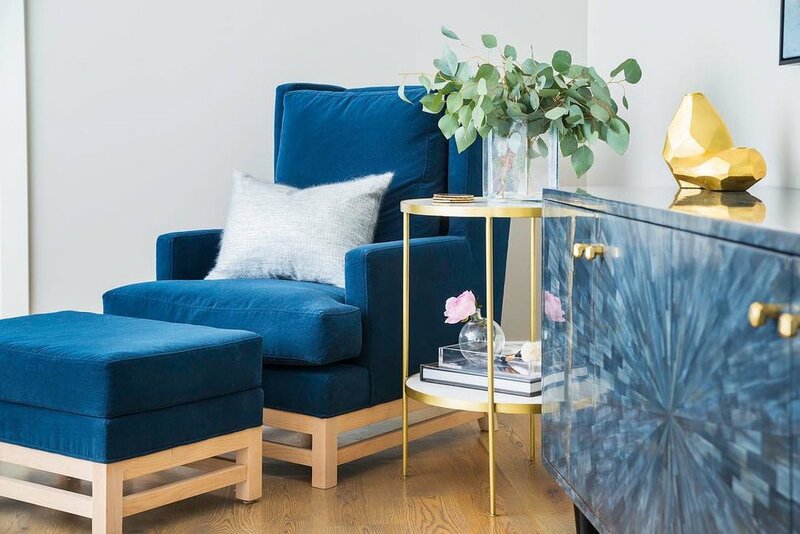 We're always open to a traditional sofa because it can be mixed with so many styles and will only need to be updated with new pillows and a throw." Mid century modern take with a flare of femininity! Why MON loves this sofa: If you're open to modern furnishing but you still want a livable look, the Elle sofa is the way to go. It's inspired by a traditional tuxedo sofa because of it's clean lines but it's soft cushions make this sofa great for sitting back and reading a book (or let's be honest playing on our iPads). If you have a sunroom or a living space for entertaining, the Elle sofa would shine in these environments. HOW USING A DESIGNER SAVES YOU MONEY. That's a truthful statement you probably never thought of. Mistakes made in the home eat up $$$. Designers know a lot about a home and they also know how to save you from making costly mistakes. Think about that time you spent $800 on a sofa... and then think about how two years later you were shopping for a new sofa. Making that same mistake will cost you $4,000 within 10 years. (and that doesn't include the shipping and delivery fees!) A designer knows how to shop for QUALITY... so you're more likely to spend $2,500 on a sofa that will last you 20+ years. There are thousands of fabrics and finishes the design world has to offer... and ain't nobody got time to look through all of that! Designers are exposed to fabrics and selections every single day so it's very easy for us to choose not just a fabric... but the fabric for your home in a short amount of time. Because... many of us drink wine at home while watching The Bachelorette... and many of us have kids with Cheeto fingers. That's life. We understand! An unlimited bank account is ideal but not alway realistic. Designers are experts who know how to work with your finances. We know where to spend the money and where to save the money. We know how to mix in high - low design in order to maximize your look. We know where to shop and how to shop. (Honestly, it's the BEST when you work with an insider of the Design World!). When designers walk into an empty room, they already know how much furniture will fit in a room. They also know what type of furniture will be best in the room, what colors will work best, what size chandelier you will need, what size rug you will benefit from... etc. It's easy for us to visualize it all because we do this on a daily basis. Have you ever gone to the store to pick out pillows and checked out 10+ pillows so you can see which ones will work? Have you also hauled 10+ pillows out of your car, into your home, back into your car, and back to the store to return it because NONE of them worked out??? Okay, how about this scenario: Have you ever walked into a paint store to pick out wall paint only to feel overwhelmed, confused, and even annoyed at the thousands of paints to choose from? Designers know what will work together. We don't have magic in our blood... we worked really hard to learn what colors and patterns work and what don't work in a space. Our Market on National team goes through hours of an intense Certified color training and a lot of research on pattern mixing. If you're interested in looking into design services at Market on National, we have a curated menu available for you to explore. CLICK BELOW TO LEARN MORE. We're noticing a big push towards rough, hand-made textures to intrigue the eye and to add interest to a room. With homes moving from traditionally formal styles to casual, lived in styles, we encourage incorporating organic elements in the home. You will not be disappointed once you begin to feel the comforting warmth natural elements add to the space. Since Greenery is Pantone's color of the year, we just had to add in a Magnolia Home pillow! It's fun, intricate details make this a textile that'll standout. 1. The Primar Bench: Features a woven rattan wrap that gives this bench an outdoor look that's comfortable enough for an interior space. Can you imagine this bench at the foot of your bed or even greeting you in the foyer? Meant for short periods of sitting, the Primar bench will do it's job while encompassing that earthy look we love! We picked some gold dipped accessories to add a little glam and excitement because... why not? 2. You'd be surprised how a room will suddenly look finished when you add just a hint of nature. Botanicals speak and breathe life just by being what they are. They brighten up a room and lift up your spirits. However, if you're like us and have difficulty keeping plants alive then you do have the option of going for life-like botanicals that are little-to-no maintenance! 3. Drexel End Table: This piece is certainly a show stopper! The Drexel end table was featured on our Instagram because it's just so unique. The acid-etch top definitely enhances the industrial look and the legs say that it's been worked on quite a bit to get that organic curve. After searching for weeks for the perfect sofa, you are suddenly faced with having to pick out the right fabric. This process can be stressful! In order to make the process quick and easy, we're showing you how we picked out fabrics for a Robin Bruce sofa. This option will be your main fabric and will cover your whole sofa. The first thing we like to consider is versatility and durability. Picking out a neutral fabric means you'll always have a sofa you can work with as your style changes throughout the years. 1. We picked out a solid, beige fabric made from 100% polyester. A polyester fiber is a synthetic material that is strong, wrinkle, and abrasion resistant. With the feel of linen without the upkeep, it's ideal for a sofa you're going to use everyday. Some sofas come with the option of customizing the toss pillows. The "Bristol" sofa comes with five toss pillows. At no added charge, we can pick out any fabric! How fun! 2. We used another neutral fabric that had a lot of pattern within it's texture! A patterned texture against a smooth body fabric create a soft contrast. Perfect for two toss pillows! 3. For two more toss pillows, we decided on a windowpane pattern that introduced some color. 4. To breakout the geometric patterns, an organic print with a lot of color is exactly what's needed on the lumbar pillow! This pillow can easily be reintroduced in the spring and summer months if you prefer to redecorate during the holidays. Don't let large fabric racks scare you. It's easy to reduce and simplify once you have a basic idea of what you want. It's even easier with a little guidance from MON. We're so happy to finally receive our Bristol sofa! Here is the finished look. To continue our talk on fabric, we decided to take a step up and discuss something a little more complex, leather and it's amazing qualities. There is a beautiful quality of leather that comes purely from the fact that each leather is unique and will come with it's own characteristics. Top-Grain Leather: Top grain leather is most commonly used in high-end leather furniture. It's a durable leather that is built to last. It can come in a smooth or wrinkled texture and will show it's natural markings and scars. Bonded Leather: Think of bonded leather as reconstructed leather. It's made from smaller bits of leather that have been glued or "bonded" for the look and feel of a solid piece of hide. Bonded leather is inexpensive and can give a great sophisticated look without the price of genuine leather. Vegan Leather: Oxymoron aside, vegan leather is a great alternative to genuine leather because it is made from all man-made materials. Perfect for those who love the look of leather but don't want the real thing. Well made vegan leather will almost be indistinguishable from the real thing. Our Chester Lounge chairs are vegan, but you would never know! In all genuine forms, leather will bear the marks of it's natural origin. That's the beauty of leather.